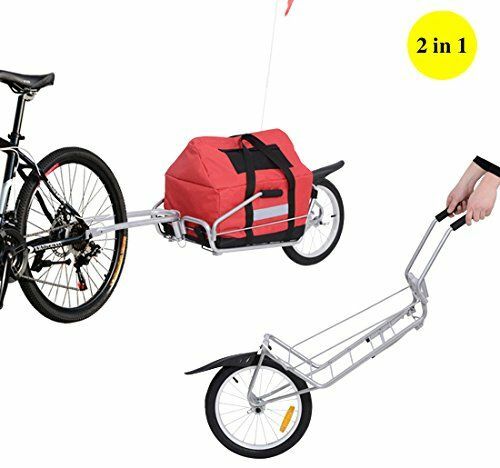 It could easily be made into a bike trailer. Any way to lower the panniers? Right now it looks like the are completely above the axle, if you could get part of the weight below the axle that would help with balance. eugene wrote: Any way to lower the panniers? Right now it looks like the are completely above the axle, if you could get part of the weight below the axle that would help with balance. Balance didn't seem a huge issue when I tried it out. I'm probably overstating the balance issue, it is only more tippy compared to the previous cart, not really that tippy in general. I would still like it to be less tippy, hence buying a narrower rack. I won't lower the panniers below the axle if I can help it as I don't want to give up ground clearance or approach angle. Zed Hunter wrote: It could easily be made into a bike trailer. This would be a huge plus to me, and I've mulled it over a bit but haven't come up with a turn-key way to do it. I won't do anything that requires fab work so I'm pretty limited on actual implementation. (Excuses) I'm getting old, my time is valuable and I can often learn faster through the trials of someone else with better ideas. RR. +1 for being MacGyver-like on this forum. Innovate-adapt-overcome is but a bumper sticker these days except for the people that practice it. Well done. Curved tubing like some bikes have for center bar clamped rigidly to fork just under handle bars rising over the rear tire of the bicycle to a pivot under The seat. The cart/trailer would be facing backwards. Remove tow bar and use as cart. RonnyRonin wrote: I'm probably overstating the balance issue, it is only more tippy compared to the previous cart, not really that tippy in general. I would still like it to be less tippy, hence buying a narrower rack. I won't lower the panniers below the axle if I can help it as I don't want to give up ground clearance or approach angle. Anything higher than ~1/3 of the wheel diameter you can't easily roll over so you would have to lift up anyway. I'd drop the panniers down to about there and it won't really affect ground clearance. To make things simpler I bet you could do two bars in a V fashion that could clamp on your handlebars. Then you could even put a pack on top of the V.
If you simply turn around you can quickly pull the cart over much taller obstacles then you can push it, well over 1/3rd of the tire. Ground clearance isn't a huge concern most of the time, but side-hilling is a function of width and vertical clearance and I since I consider my balance issues already solved now I don't see much to be gained from giving that up. I don't really know of a way to get the panniers lower without just throwing $100+ at a new rack, and most of the lowriders give up the flat deck on top which I am quite attached to. My custom panniers will likely be a bit taller and hang closer to axle line, which if loaded properly should accomplish some of the same ends. once again, any solution involving welding is off the table for me. I do have a tagalong trailer and hitch that could be cut up for the gooseneck portion but the gooseneck-to-cart interface is a big question mark. Enough pipe clamps and bolts would likely get the job done but a clean quick detach solution eludes me. This is my bike and trailer, it appears the handle bar mount on the trailer is close enough to the right height that you could just clamp the handlebars on the cart in. If I could find some wing-headed bolts it would at least be a tool-less removal if not quick detach. Since the gooseneck can pivot freely up and down the interface would have to be very secure or else the gooseneck and top of the cart would likely creep down overtime till they touched the rear tire. If you have a specific clamp in mind I would love to see it, I can dream up ones that would work but I haven't seen them for sale. Defining WHAT needs to happen is quite simple, it is the actual details of HOW that I haven't quite fleshed out. The electrical conduit section of Lowes or Homeboy Depot you'll find lots of nice clamps, if you zoom in on my pics you'll see one holding the rack to the trailer bike seat back. Make an A frame with the top of the A having a couple hinges and clamping to your seat and the bottom of the A clamping to the handlebars just inside the grips. Then a third shorter bar from the center of the A to the stem of your new trailer so it will hold it upright. Though if your trailer bike has the foldable tongue like ours, you could fold it and make a handelbar attachment that slides in it there. well, drawing works in preview. Far from perfect, but I haven't had a chance to come up with a better solution yet. You may have to drill and tap new threads on one side or the other, but if the bar clamp on the tagalong and your single-wheel “cart” are the same inner diameter, just use the fixed clamp half from the tagalong and the cap from the other...maybe a simple piece of drilled and tapped flat stock (or just drilled if you use long nuts/bolts) behind the clamping point to serve as an adapter. If not the same ID, I’d simply find a bar that works with the tagalong...even if that meant getting a new stem for your cart’s fork. There may also be a sping coupling/clamp that you could use in between as an adapter. We had one on the two-wheel trailer (In Step brand maybe?) we’d pull behind our bikes on the tow bar where the it clamped onto the bicycle frame from the side. Allowed some flex while staying rigidly affixed. 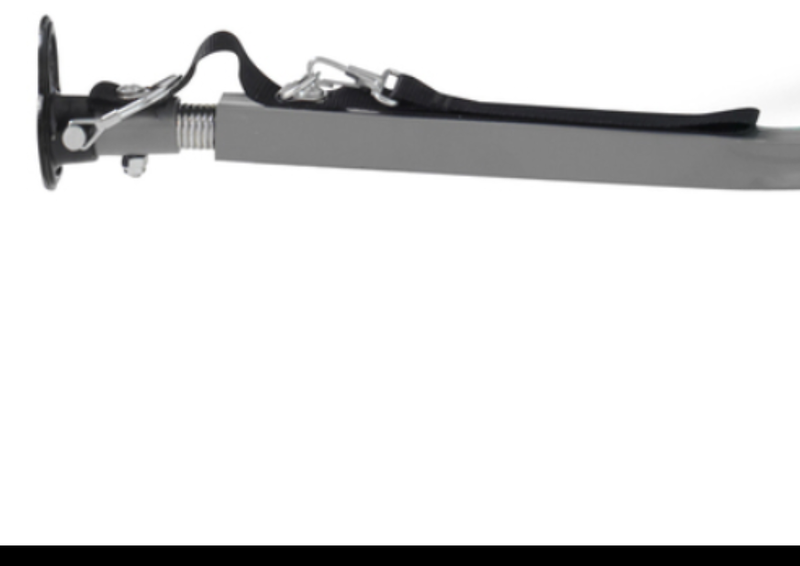 Alternately have a short horizontal bar mounted above the handlebars of your “cart” for the tagalong to clamp onto... maybe on two short bicycle stems that are a small enough diameter to clamp around the handlebar on either side of your fork stem. It would look like a square when finished. Or spend a few bucks and get a custom piece welded! Because of the angles involved a 1:1 wouldn't work, but likely an angled adaptor could be fabed. This and the existing make-do I posted both suffer from being pretty slow to switch from trailer to cart mode, some kind of QR clamp would be ideal, something that simply held two pipes in parallel would let me clap the tagalong tube to either the stem or fork tube on the cart, but I have found no such clamp. If not the same ID, I’d simply find a bar that works with the tagalong...even if that meant getting a new stem for your cart’s fork. Really not sure what you have in mind here, two clamps/stems simply can't both occupy the center of the bar at once. I've seen one-piece bar/stem combos that leave the center of the bar clear but being made for bikes the stem would be facing the wrong direction. Short of finding a better single clamp solution this is likely the direction I will have to go. I am really trying to keep this project 100% duplicatable with off the shelf parts so anyone can build one without custom parts. My local hardware stores only had very small versions of these I wouldn't trust under load, but with a big enough clamp and wingnut this would fit my criteria of tool-less semi-QR removal. not tool-less, but might work for either straight tube-to-tube mating, or the secondary handlebar solution Eunozs described, would likely need two either way. 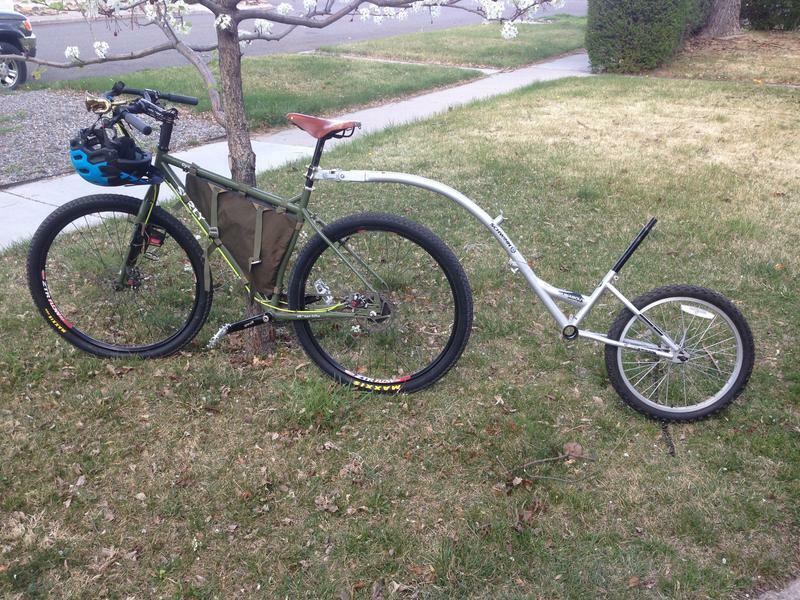 Something like this with wingnuts on the cart side might be my huckleberry, just need allthread and some bent flat bar. Though I much prefer your fat bike tire, maybe push the easy button? Or rig some way to connect the cart stem or bars to the bike’s rear axle? Dont know if youve solved the parking brake issue or not yet, but most bike rimbrakes have a nut on the lever that lets you adjust for wear on the pads, or an out of true wheel. You'll find the brake cable housing running through it. Adjust it close for normal use, and you may be able to turn it a couple more times to pinch the rim when you want to stay, couple turns back to get going again. 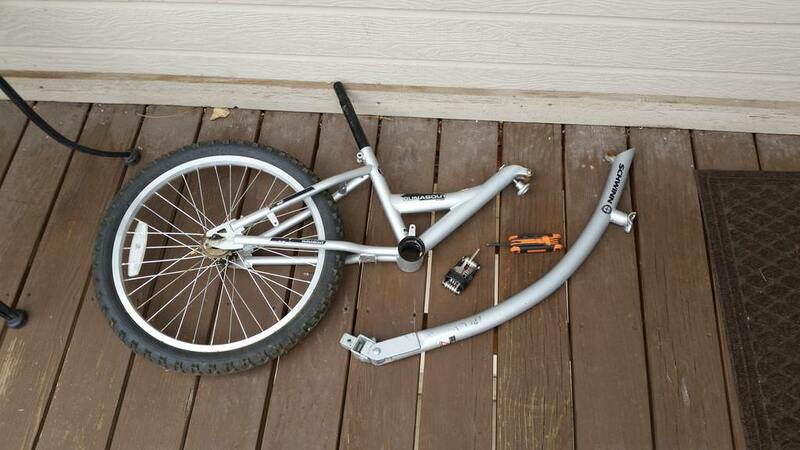 Bent rims probably are not going to be an issue on a lowspeed application like this. And how would you go about that; specifically? Seems like I would just be starting from square one, hunting down one specialized clamp still seems easier then creating a whole new attachment method from scratch. While I will probably get a BOB (brand) trailer eventually the disadvantages of a non-centered load on a hand cart are to great for me to seriously consider one as a solution. don't currently fit as the difference in diameter is to great between the tagalong and the fork tube, but I'm going to try cutting one side down before I give up on them. I added some giant wingnuts and lock washers to try and make them quicker on and off. I actually ended up pulling the brakes off the original cart all together, unless I run into a situation that changes my mind I have so far enjoyed the lack of moving parts and cables more then the extra help stopping. 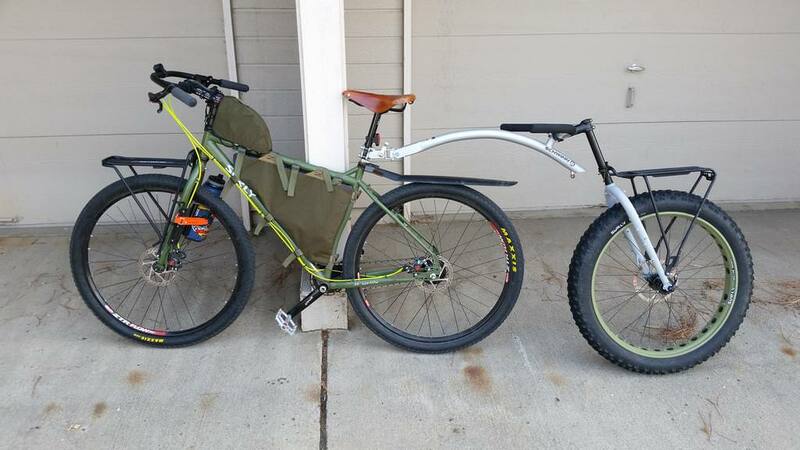 I've gone ahead and installed the solid fork on my Paratrooper, so that's out... but, my daughter has far outgrown her Trail-a-bike, and while I was down in the basement pondering the idea of modifying our tandem into a solo cargo-touring bike, my eyes fell upon the little t-a-b. I don't think I'd go as far as cutting on anything to make it a better push wagon, but I'd concentrate more on its trailer-a-bility, cutting the handlebar short, or just replacing it with some straight tubing, and running another tube across, atop the seatpost. These would be the base for a platform, which could hold bulky items on top, and maybe up to two sets of panniers on the sides. If I had to ditch my bike, I'd have to work out a way to guide it as a push-cart, but in an emergency, I can see using a small hacksaw to remove the portion ahead of the handlebar stem so I can use the forward bar to guide it. The tire would be either a heavy duty "puncture resistant" model, or I'd even go airless, though I'm not as fond of airless on the bike itself. If I were really feeling froggy, I could keep some of the drive parts on there, and run a small hub, or mid-mount motor on it, just for a little help on the hills. Pusher electric trailers seem to work well enough, and I wouldn't be putting all that extra weight and complexity on my bike. Also, as they did in Vietnam, a pole can be rigged to the handlebars to more easily guide the bike uphill, when the weight is just too much to easily pedal.